Frankly, it does not tell you much of anything except the violence of the horrific impact which completely lifted the heavy crane off the ground. More interesting would be an onboard which might give some sense if Bianchi could have seen the waving yellow flags and slowed down in time. But, if it exists, the FIA and Marussia are not releasing it. A number of readers will certainly question why there was a green flag waved at station 12. It is technically the station beyond the accident and the green flag would signal a clear track in the segment beyond it. However, given the proximity, the presence of track workers in the runoff area and the conditions, questions are bound to be raised. the real question is ? 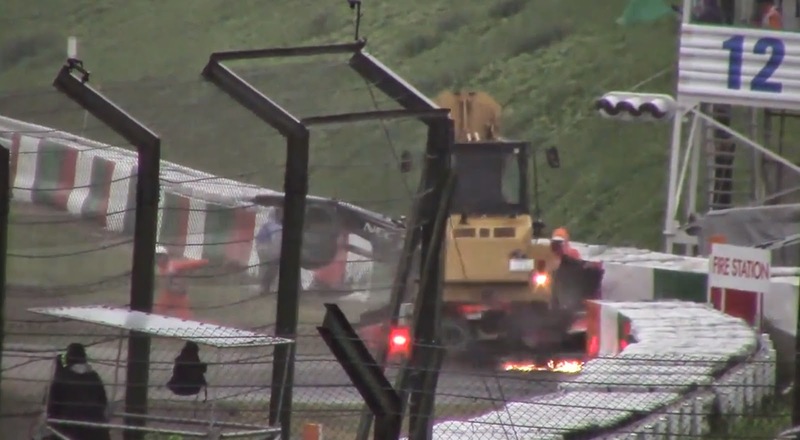 due to the bad spilery track conditions plus a tractor exposed in the track area, WHY NOT deploy the bloody safety car ? Honestly, green flag or not, it wouldn’t make a lick of difference. He aquaplained and had no way of avoiding going straight off. The only way that would be avoidable is if F1 had the safety zones like in the 24h of Nürburgring or Le Mans. If I understand correctly, the only condition pilots have to meet at a yellow in F1 is slowing down, and that means in the 130R going at about 200 kph instead of 260+. It’s too fast, no matter how much you lift off. Downforce(control) drops with speed. I don't know what speed can be considered safe. I do know Jules is an F1 driver and he knew what he was doing. It appears in the frame before impact his helmet was very low in the cockpit, with the belts and bolsters he would have had limited movement but only the top of his helmet was visible in that frame. I feared for the worst (near decapitation), fortunately Jules cheated the reaper; for the time being at least. Salud Jules, may you recover fully and race again. I had really hoped for something else. A back-in shunt that just knocked him out, maybe. But what happened is terrifying. Given his current reported condition he clearly missed, by a matter of inches, a much worse immediate fate. On most circuits, most corners, these machines aren't exposed for very long, but that entry way is so far, and the speed there so great, and nothing about that machine is designed to be 'safe' in any sort of impact - quite the opposite. Hope he makes it. Always seemed like a nice kid in the interviews. Negligence comes from the teams then. Nothing stopping them from pitting and putting on a new set of full wets that could have handled that rain perfectly. This was a perfect storm. Had they done a safety car that would have taken many laps it would have left the race with maybe 2-5 laps left and everyone would have criticized that severely. No win situation for the FIA in the court of public opinion. This was just a terrible accident with some terrible luck. Don't forget Honda's first attempt at F1, the 1.5 liter V12, mounted sideways. It won the Mexican GP, I believe. These pictures show everything I love about F1 circa 1964: (1) Lots of different engines -- V8, V12, H16. (2) Americans: Not only the brave and enigmatic Richie Ginther, but also Dan Gurney's Eagle cars. (3) The most beautiful cars ever. (4) Paddocks where normal people could get close to the cars, drivers and crew. Fernando is so adaptable, don't you think he would have been as good in 1964 as he is in this generation? I sure hope Honda & McLaren give him a car he can win with. Hi.I'm sorry about my first post here is in this situation, but i have a question that you guys maybe can answer. I don't want to blame any or something like that. I think they did it ok not deploying the Safety Car , Double yellow flag should be enough, the question is if Charlie Whiting is forced to tell drivers about the dangers of the track specially with cranes on track and even more with the weather conditions. I think when Adrian crash Bianchi seems to be just ahead so probably he didn't realize about it. So if he didn't see the flags with the spray he should know about it. I think this is the key to see if there was any "mistake" in this accident or it was a terrible bad luck crash,so f1 can learn to avoid them on the future. Because, as http://formerf1doc.wordpress.com says, double waved yellow means 'you may need to stop suddenly, slow right down'. And it's fairly clear drivers don't.